The mission of Huntsman Cancer Institute (HCI) at the University of Utah is to understand cancer from its beginnings, to use that knowledge in the creation and improvement of cancer treatments, to relieve the suffering of cancer patients, and to provide education about cancer risk, prevention, and care. In 1995, the Huntsman family pledged $100 million to construct a state-of-the-art cancer center, formally establishing and naming HCI. HCI is wholly owned by the state of Utah and is designated by the state legislature as the official cancer center of Utah. HCI’s campus in Salt Lake City includes state-of-the-art cancer research space and a cancer hospital that utilizes a team approach to cancer care. HCI has two community clinics in the surrounding area and five affiliate hospitals in neighboring states. HCI hosts more than 142,000 patient visits annually and its Salt Lake City and community clinic locations. HCI operates several clinics that focus on patients with a family history of breast, colon, melanoma, pancreas, and prostate cancers. HCI operates the only Phase I clinical research program in the region. Approximately 150-200 clinical trials are open for enrollment at any given time. HCI has more than 177 research teams, that study all aspects of cancer. More genes for inherited cancers have been discovered at HCI than at any other cancer center in the world, including genes responsible for hereditary breast, ovarian, colon, head, and neck cancers, along with melanoma. HCI has provided patient and prevention education to more than 1 million residents from all 50 states and six continents. HCI is the only National Cancer Institute–designated Comprehensive Cancer Center in the Mountain West. It serves the largest geographic region of all centers, covering Utah, Idaho, Montana, Nevada, and Wyoming. HCI manages the Utah Population Database (UPDB), the largest genetic database in the world. The UPDB includes information on more than 11 million people, linked to genealogies, health records, and birth, death, and marriage records. HCI is ranked among the Best Hospitals for Cancer by U.S. News and World Report. This year, 1,735,350 new cancer cases are expected to be diagnosed in the United States. In Utah, 10,950 new cases are expected. In 2018, 609,640 Americans are expected to die of cancer—almost 1,670 people per day. Almost nine Utahns per day are expected to die of cancer in 2018—a total of 3,170 people. Cancer is the second leading cause of death in both Utah and the United States. In Utah, the top five diagnosed cancers are prostate, breast, melanoma, colorectal, and lung. Utah has the highest rate of melanoma in the United States and a much higher incidence of thyroid and prostate cancers than other states. In the United States, approximately 40 out of 100 men and 38 out of 100 women will develop cancer in their lifetimes. Cancer is the leading cause of disease death in children. The greatest risk factor for cancer is age. About 87 percent of all cancers are diagnosed in people 50 or older. Smoking is estimated to cause 32 percent of all cancer deaths in the United States. The World Cancer Research Fund estimates that 20 percent of the cancer cases in the United States are due to the combined effects of excess alcohol consumption, poor nutrition, physical inactivity, and excess weight. There are an estimated 15.5 million cancer survivors alive today in the United States. The Agency for Healthcare Research and Quality (AHRQ) esti­mates that the direct medical costs (all health care expenditures) for cancer in the United States in 2015 totaled $80.2 billion. In 1995, the Jon and Karen Huntsman family started Huntsman Cancer Foundation to ensure the future of cutting-edge research at Huntsman Cancer Institute (HCI) at the University of Utah. Huntsman Cancer Foundation’s sole purpose is to raise funds to support the mission of HCI. All HCI fundraising initiatives occur through Huntsman Cancer Foundation, which is a public, functionally-integrated, Type III 501(c)(3) organization. Due to the generosity of the Jon M. Huntsman family in underwriting all fundraising expenses, 100 percent of all donations further the treatment, education, and research being conducted at HCI. Huntsman Cancer Foundation’s Board of Directors includes Chairman, Peter Huntsman, University of Utah President, Ruth Watkins, President and Chief Executive Officer of Zions First National Bank A. Scott Anderson. One family cannot do it alone. Huntsman Cancer Foundation has received over 1 million gifts in support of the vision of the Huntsman family. Through Huntsman Cancer Foundation’s Huntsman Heroes program, individuals and teams run, walk, ride, and fundraise while participating in events from 5Ks to marathons to 140 mile bike rides. The new research building expands Huntsman Cancer Institute (HCI) by 225,000 square feet, doubling HCI research space. The added space allows HCI to sharpen its research focus on pediatric cancers and cancers that run in families. The building will house many unique resources and technologies, including cancer biostatistics, genetic counseling, genomics and bioinformatics analysis, research informatics, and the Utah Population Database. HCI currently employs 1,800 faculty and staff. When the building is fully operational, HCI will have the capacity to grow to nearly 2,600 individuals. The new building includes 276 new research lab benches. With this major expansion, HCI has one mile of lab bench space devoted to cancer research. Exterior walkways and sky bridges connect the new research building with the original HCI research building and the cancer hospital. The building exterior is designed to withstand winds of 115 miles per hour. The building is LEED-certified. The landscaping includes four rooftop gardens to enhance energy efficiency. The building cost $173 million to construct (including financing). An independent economic analysis estimates the new research center will add $110 million annually in business activity and $59 million annually in real disposable personal income to the state of Utah. Principal support for the expansion was provided by the Jon M. and Karen Huntsman Family, Huntsman Cancer Foundation, The Church of Jesus Christ of Latter-day Saints, Intermountain Healthcare, and the State of Utah. 1986 Cancer program at the University of Utah earns National Cancer Institute designation as a Cancer Center, with an emphasis on genetics research as a way to understand, diagnose, and treat cancer. 1993 Jon M. and Karen Huntsman donate $10 million to the University of Utah to establish a cancer institute. 1994 Cancer center receives custodianship of the Utah Population Database (UPDB), a resource for biomedical research that contains health and vital statistics records from several generations of Utah families. 1995 The Huntsman family pledges $100 million to construct a state-of-the-art cancer center, formally establishing and naming Huntsman Cancer Institute (HCI). 1996 HCI breaks ground for a new 231,118 square foot research, treatment, and education facility. 1997 HCI joins the National Comprehensive Cancer Network (NCCN), a not-for-profit alliance of the world’s leading cancer centers dedicated to improving the quality and effectiveness of care provided to patients with cancer. Jon M. Huntsman Research Center at HCI is dedicated; patient clinics open. 2000 Jon M. Huntsman pledges $125 million to fund cancer research and construct the Huntsman Cancer Hospital. 2001 Construction begins for new hospital. 2004 HCI Cancer Hospital opens, featuring first full-field digital mammography unit, first PET/CT imaging unit, and first facial prosthetics lab in the Mountain West. 2005 HCI and Intermountain Healthcare join forces to create the Huntsman-Intermountain Cancer Care Program, opening research opportunities to advance cancer care. 2007 Cancer Center member Mario Capecchi, PhD, wins Nobel Prize for Physiology or Medicine for gene targeting research. 2009 A donation from Jon M. and Karen Huntsman to the University of Utah establishes five Presidential Professorships in Cancer Research to commemorate HCI’s 10th anniversary. 2010 The National Cancer Institute renews HCI’s designation as a Cancer Center; HCI holds the only such designation in the five-state Intermountain West. 2011 Jon M. and Karen Huntsman donate $41 million to cancer research at Huntsman Cancer Institute. Huntsman Cancer Institute 156,000 sq. ft. hospital expansion opens. 2015 National Cancer Institute awards HCI Comprehensive Cancer Center status, the highest national designation possible. 2016 Vice President Joe Biden visits HCI to discuss the National Cancer Moonshot Initiative. 2017 HCI opens new Primary Children's and Families' Cancer Research Center. 2018 Huntsman Cancer Foundation announces major gifts to support cancer hospital expansion plans. 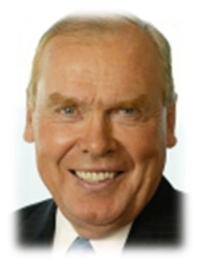 Jon M. Huntsman, a native of Blackfoot, Idaho, is Founder and Executive Chairman of Huntsman Corporation, a global manufacturer and marketer of specialty chemicals. Almost fifty years ago, Mr. Huntsman began a small entrepreneurial plastics packaging business. Originally known for pioneering innovations in packaging and, later, for rapid and integrated growth in petrochemicals, its operating companies today manufacture chemical products used in a wide range of industries, with more than 16,000 employees and multiple locations worldwide. The Company’s 2015 revenues exceeded $15 billion. Mr. Huntsman earned his undergraduate degree at The Wharton School of Business at the University of Pennsylvania and an MBA from the University of Southern California. He has been awarded thirteen honorary doctorate degrees. Mr. Huntsman was a U.S. Naval Gunnery Officer. He served under President Richard M. Nixon as Special Assistant to the President and as White House Staff Secretary. Mr. Huntsman is widely recognized as one of America’s foremost concerned citizens and philanthropists. His lifetime humanitarian giving, including contributions to the homeless, the ill and the under-privileged, exceeds $1.5 billion. He has assisted thousands, both domestically and internationally. He was named One of the Ten Most Influential Utahns in the 20th Century in 2000. He was a member of the American Red Cross Board of Governors from 1997-2005 and from March through October, 2013. He also serves on the board of the Beaumont Foundation. Mr. Huntsman and his wife, Karen, founded the Huntsman Cancer Institute (HCI) in 1995 to accelerate the work of curing cancer through human genetics. Mr. Huntsman’s early contributions to Huntsman Cancer Institute amounted to $225 million. The Institute is now one of America's major cancer centers dedicated to finding a cure. The combined facility features leading-edge research laboratories and a state-of-the-art hospital treating cancer patients. The recently announced $125 million expansion will double the laboratory space and create the Primary Children’s and Families’ Cancer Research Center, which will focus exclusively on inherited and childhood cancers. Today, approximately $1.5 billion has been directed to the building of HCI, almost half of which was donated by the Huntsman family. Mr. Huntsman has served in senior leadership positions in The Church of Jesus Christ of Latter-day Saints for the past fifty years. His latest assignment was service as a member of the Seventies Quorum. Jon and Karen Huntsman are the parents of nine children. They have 56 grandchildren and 19 great-grandchildren. 2016 Insider Magazine listed Huntsman as second largest contributor to charities in America;Fortune Magazine names Huntsman as 2nd most generous man in America.